Ireland’s Thomas Maxwell followed some of the most famous names in road racing history including Ian Hutchinson, Robert Dunlop, Michael Dunlop, Carl Fogarty, Phillip McCallen and Ryan Farquhar to win the rescheduled MGP Newcomers A Race. Welshman Michael Rees took the honours in the ‘B’ Race after a thrilling duel with James Hind that saw the lead change hands six times. A dramatic Newcomers A Race, in which two race leaders were forced to retire, was ultimately decided by a thirty second pit lane speeding infringement that cost Steven Haddow a potential race win. Ahead of the race, which got away on time at 12.15, Clerk of the Course advised competitors that visibility was excellent all around the course although there were odd damp patches under the trees and cross winds across the Mountain section of the course. The race was started by local photographer and archivist Bill Snelling, who participated in the first MGP Newcomers Race forty years ago. 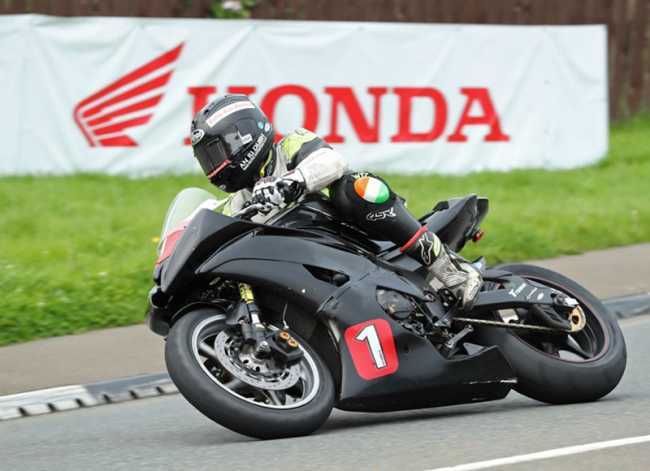 Ireland’s Mike Browne, the fastest qualifier, was first away in the Newcomers A category followed by Thomas Maxwell and The Isle of Man’s Nathan Harrison, with riders leaving the line in the order that they qualified. Browne was first on the road to Glen Helen on the opening lap and was almost four seconds ahead of second placed man Harrison on the clock who in turn was five seconds in front of Maxwell who was holding the final podium place. Haddow, from Scotland, and York based James Field completed the top five. Race leader Browne looked to be dropping time through the Sulby speed trap and shortly after was confirmed as a retirement at Sulby Bridge which left Harrison as the new leader from Maxwell with Haddow moving into the top three. Harrison’s opening lap of 119.369 gave him a lead of over ten seconds from Maxwell with Haddow a further twenty seconds back holding the final podium place. However, Harrison was then reported as a retirement at on the run in to Kirk Michael on the second lap which put Maxwell in pole position ahead of Haddow with Field up into third.